Last week, a colleague and I completed what I believe was a very beneficial exercise for all parties involved: We completed six 90-minute training programs designed to help local professionals interested in earning the Accreditation in Public Relations (APR) credential. The program was coordinated through PRSA Chicago, where I co-chair the Accreditation Committee with my friend Joyce Lofstrom, APR. Three chapter members participated. The curriculum leaned more toward the practical — navigating the APR process, using available study resources, completing the required Questionnaire, and preparing for the Readiness Review and computer-based Examination. But we did tackle the subjects addressed on the Exam — the Knowledge, Skills and Abilities (KSAs) — or, what’s been identified as essential for the advanced practice of public relations today. 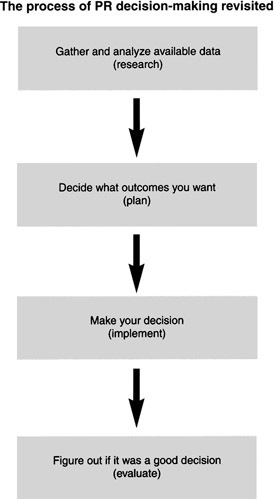 Looking back, I found the most productive session focused on crafting the framework for a public relations plan built on The Four Step Process (see one version at left) and structured around realistic goals, sound strategies, measurable objectives and tactics that make sense. At this session, our fourth, I could sense that the candidates were getting a much better grasp of effective, strategic public relations planning. “Think strategy” and “Who are the publics” were often-repeated mantras. Personally, I was energized by the program. It gave me an opportunity think creatively, and it was a tangible way to give back to members of the profession. Would I consider teaching a for-credit college course in public relations? Perhaps. But not just yet. I’m still seeking that next great job in public relations, which is a job unto itself. And, I believe I can continue to add tremendous value to the right company or organization. Back to Accreditation: It was instrumental in shaping my career and elevating my skills. But, more work needs to be done to encourage greater numbers of professionals to pursue Accreditation. Frankly, the credential is in trouble. Read this commentary from William Murray, CAE, President and COO of PRSA, just published in the June 2013 issue of Tactics . Statistics cited reveal a serious decline in professionals earning Accreditation. But I was pleased to read that PRSA leadership is taking a strategic approach to build more awareness and acceptance for the APR. In 2014, the APR credential turns 50, and next year I can mark my 10th year holding the Accreditation. I’m thrilled three members of PRSA Chicago are on course to earn the credential, and I wish them success. Just wonder what the next 50 years holds for Accreditation and the profession. Please share your thoughts, in 50 words or more.